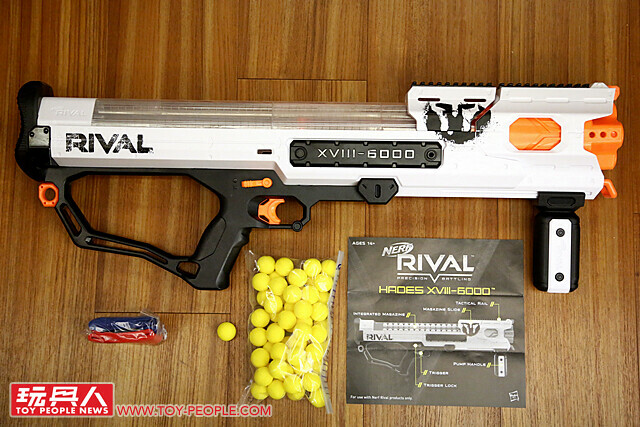 Nerf Rival Prometheus MXVIII-20K & Hades XVIII-6000 Unboxing & Review! 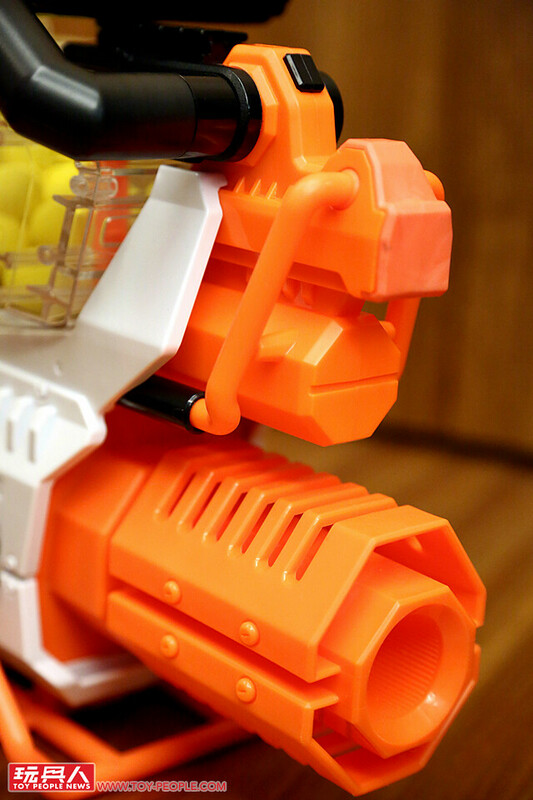 Today we lift the veil on the two heavyweight additions to the Nerf Rival blaster line from Hasbro: the Prometheus MXVIII-20K and Hades XVIII-6000! 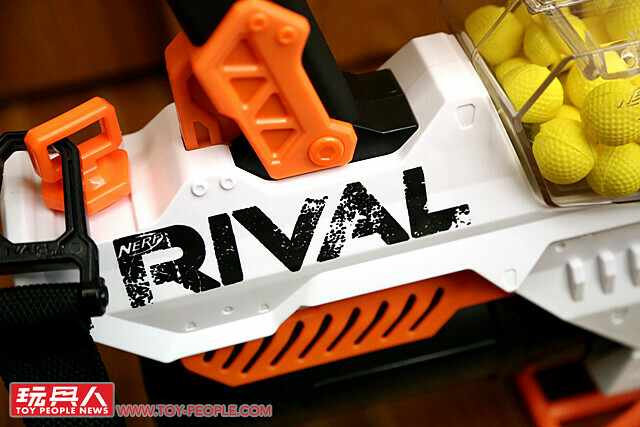 Nerf Rival debuted in 2015, elevating Nerf blaster action with spherical foam high impact rounds as well as stronger firing springs, allowing the blasters to be more accurate and fire projectiles up to 90 ~ 100 Feet per Second (FPS), the fastest in the entire Nerf line. 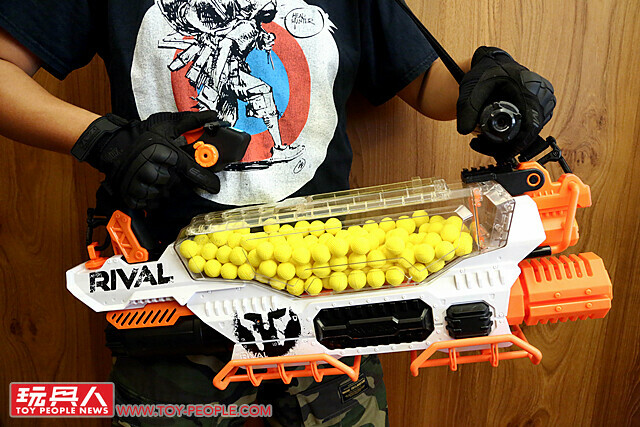 As such, the age range for Nerf Rival has been raised to those 14 and up. 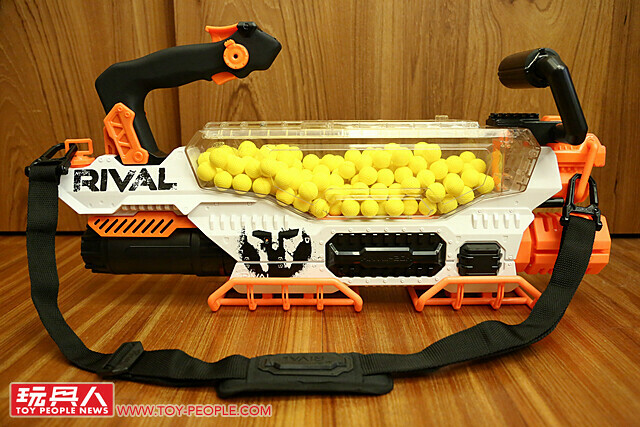 The Nerf Rival blasters, all named after deities from Greek Mythology, is based on team combat, colored to signify your allegiance to the Red or Blue teams. 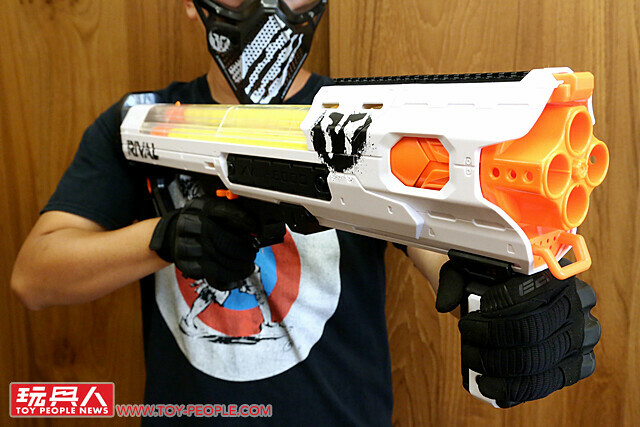 The Phantom Corps sub-series released spring 2017 is the rogue team to join the fight, allowing players to join the Red or Blue teams at will and adding an element of surprise to your Nerf Rival battles. 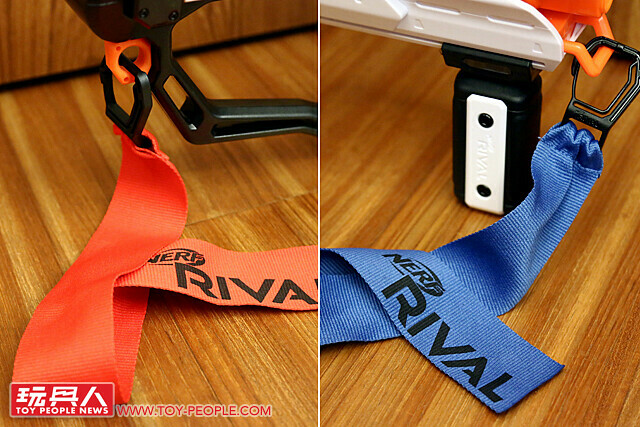 The blasters are now painted white with red or blue straps attached to indicate your team allegiance. 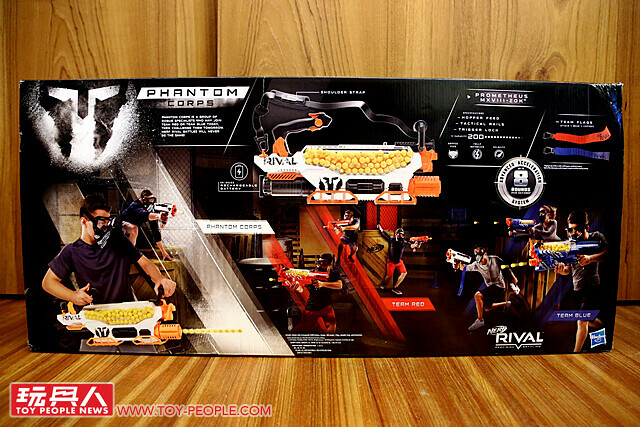 ▼ First up is the Nerf Rival Hades XVIII-6000 pump-action blaster! 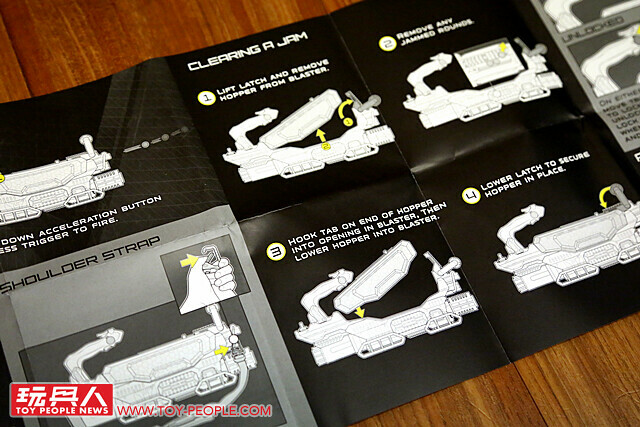 ▼ Instructions for loading and firing the blaster. 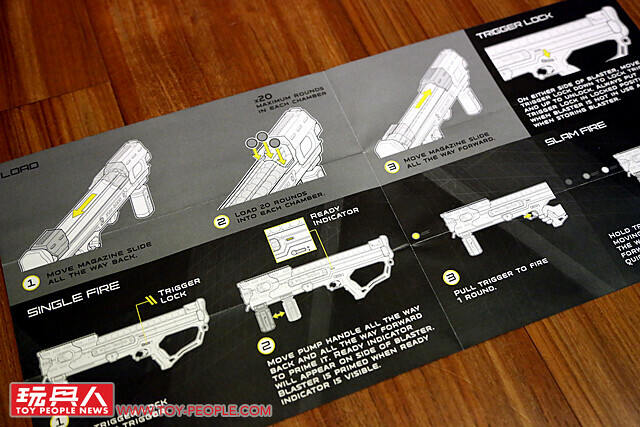 ▼ Move the magazine slide all the way back to load your ammo into the three firing chambers. Remember each chamber holds only 20 rounds! Any more and the blaster is likely to jam. ▼ There are rings at both the front and back which you can hook your team flag to. 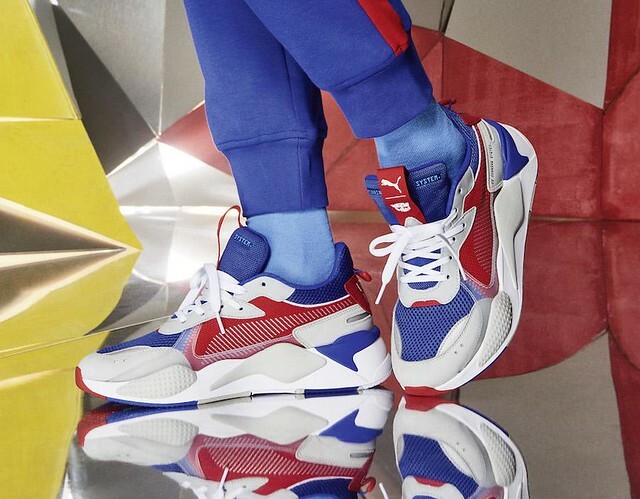 ▼ Alternatively you can fasten the flag around your arm. 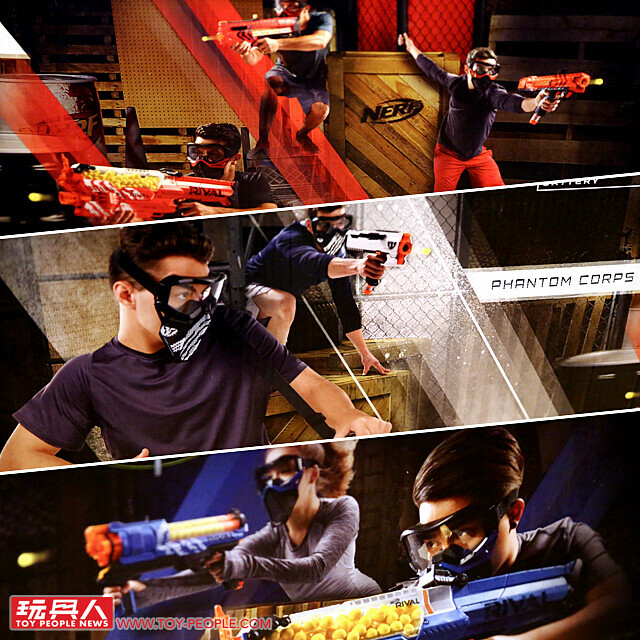 Phantom Corps members are not assigned by blaster color and are free to join either red or blue teams. 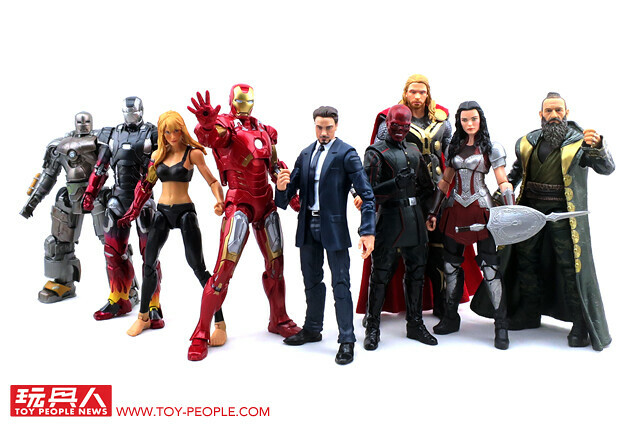 Hades is the son of the Titan Kronos and brother to Poseidon and Zeus. 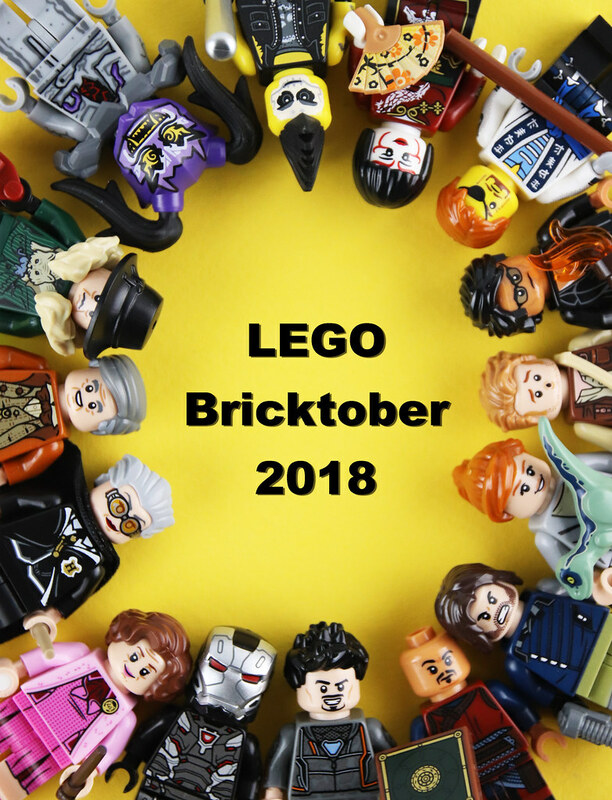 During the Titanomachy, Cyclops forged for Zeus his lightning, for Poseidon his trident and for Hades the Cap of Invisibility. 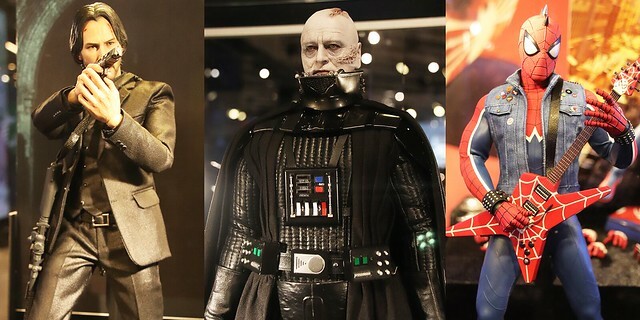 Successful in defeating their father and the Titans, the three brothers divided the world amongst themselves, with Hades given the Underworld to rule over the dead. 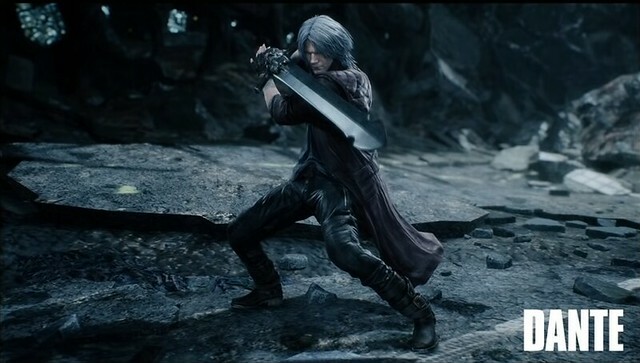 Though Hades is often portrayed as a villainous god in popular culture, in classical Greek mythology he is fair and just unlike his more selfish kin, and is one of the few gods to truly earn the admiration of the people. The gates to hell are guarded by the three-headed dog Cerberus, ensuring that any mortal who passes through the gates is unable to return to the realm of the living. 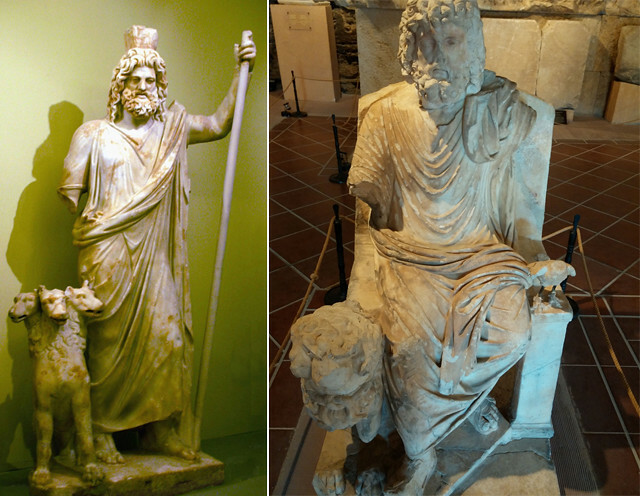 Many paintings and sculptures depict Hades with Cerberus by his side. 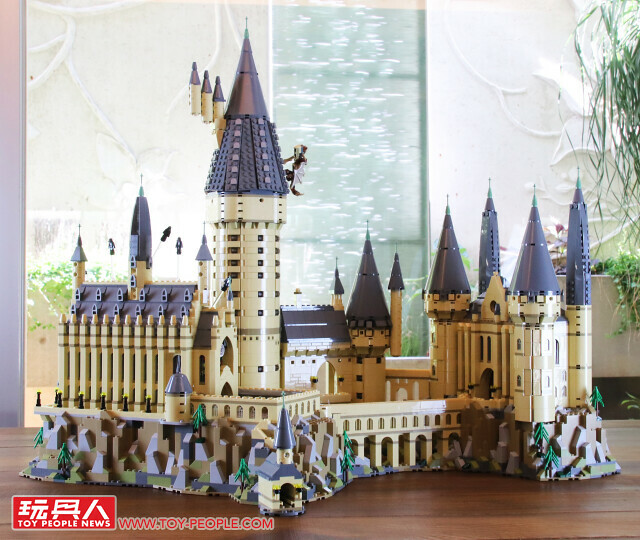 ▼ The Hades XVIII-6000 in all its glory! 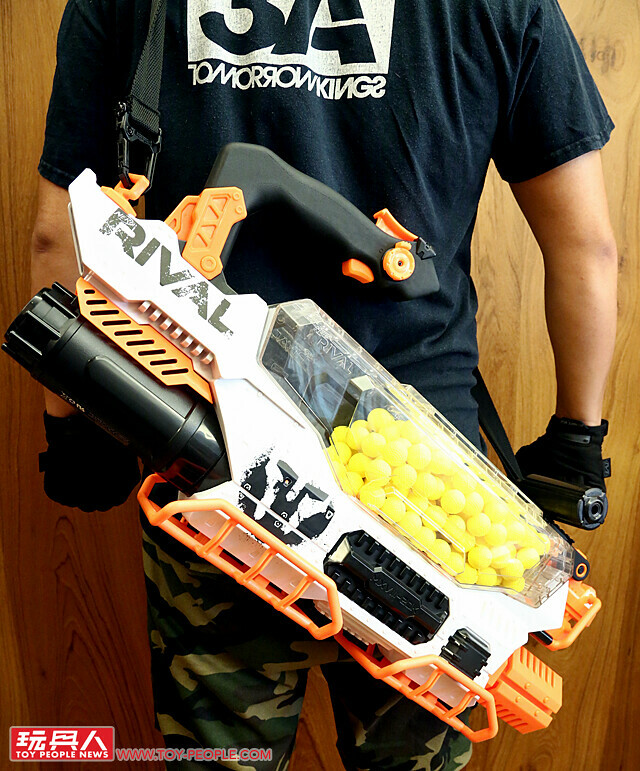 Among pump-action Nerf Rival blasters, the Hades has the highest magazine capacity and is often seen as an upgraded Artemis XVII-3000, which possesses a 30-round magazine capacity. 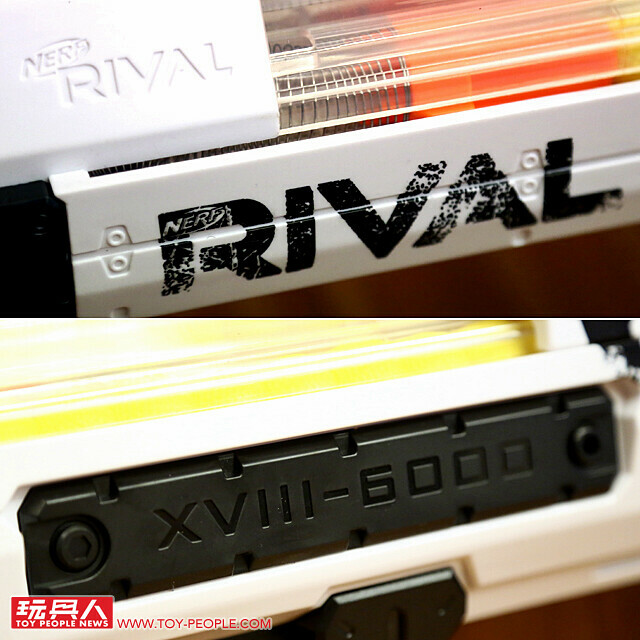 ▼ The "XVIII-6000" is sculpted into the blaster, which proudly displays the Nerf Rival logo. 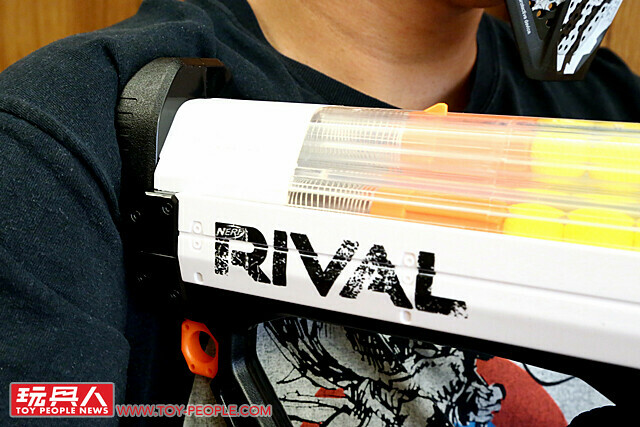 ▼ The top of the blaster features a tactical rail, allowing you to attach all sorts of Nerf Rival accessories. The Rival insignia is printed below. 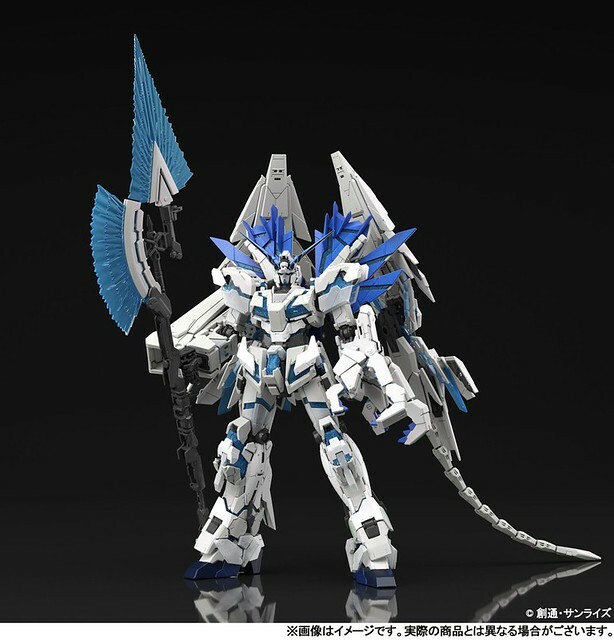 ▼ The Hades is extremely long with an extended stock that fits nicely into your shoulder, allowing you to blast away with more stability. 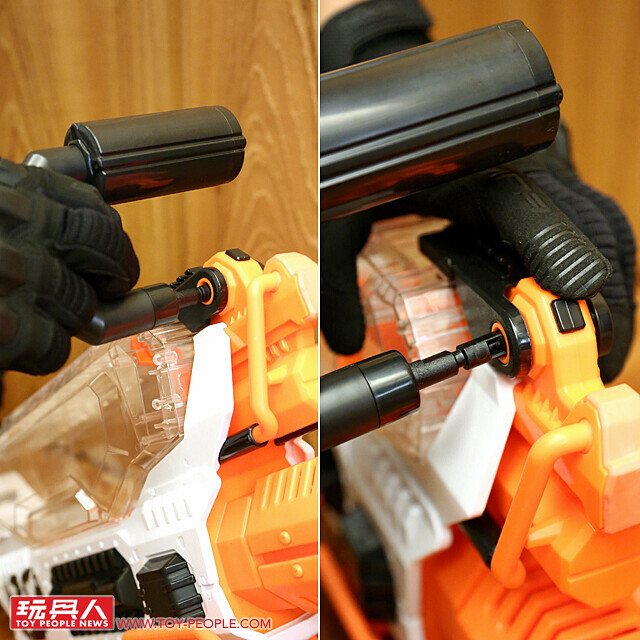 The blaster is able to achieve an astonishing rate of fire with its pump action, and the four blaster barrels rotate when firing. ▼ Despite its length, the Hades is well-balanced in its weight distribution and fits nicely in your hands. 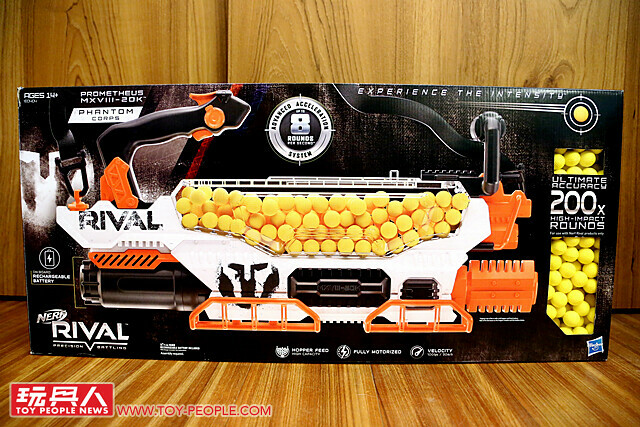 Hasbro really put a lot of thought into this blaster, with the curvature of the stock is designed to accommodate your shoulder and stabilize the firing motion. 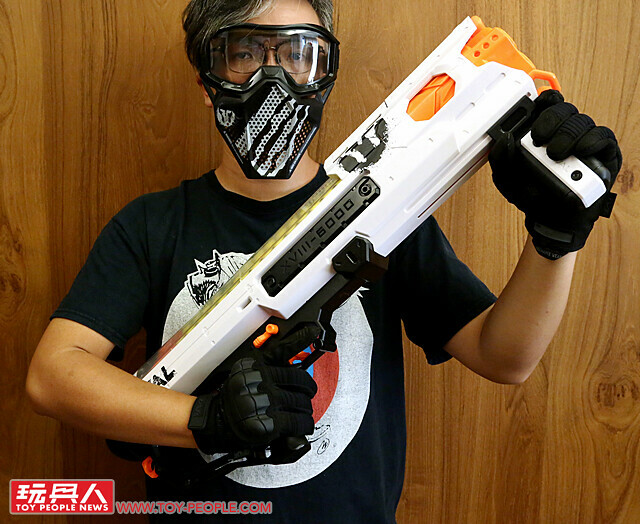 ▼ For safety reasons, the Hades includes a firing lock should you accidentally press on the trigger. 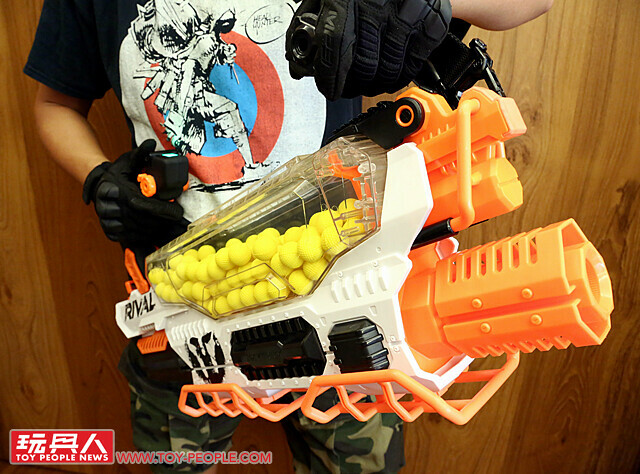 ▼ For a 5'9 (176 cm) guy, the Hades fits well, with smooth reloading and firing action unaffected by the length of the blaster. 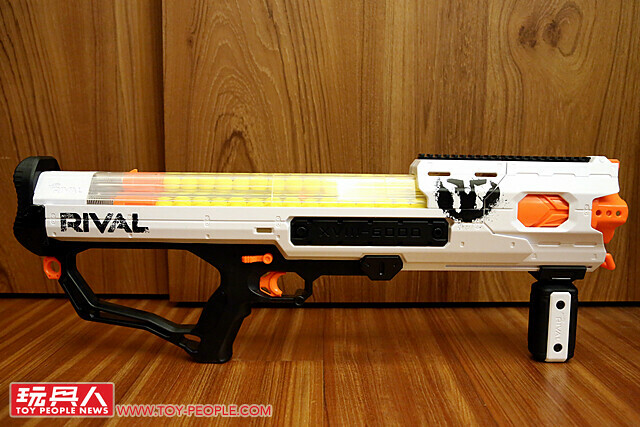 ▼ Next up is our Nerf Main Course for the day: the monster-level Prometheus MXVIII-20K! 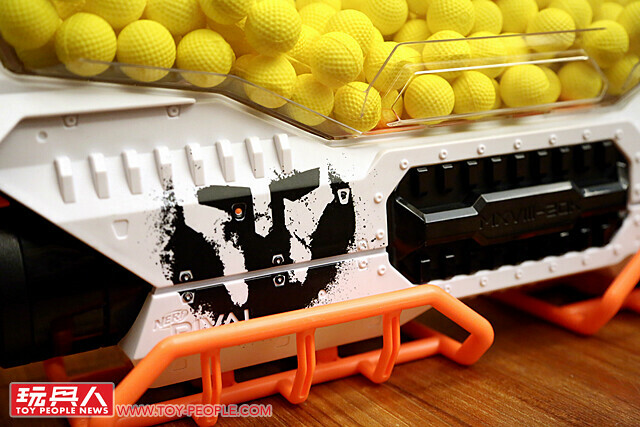 ▼ The Prometheus comes with a whopping 200 rounds, double that of last year's Nemesis MXVII-10K. 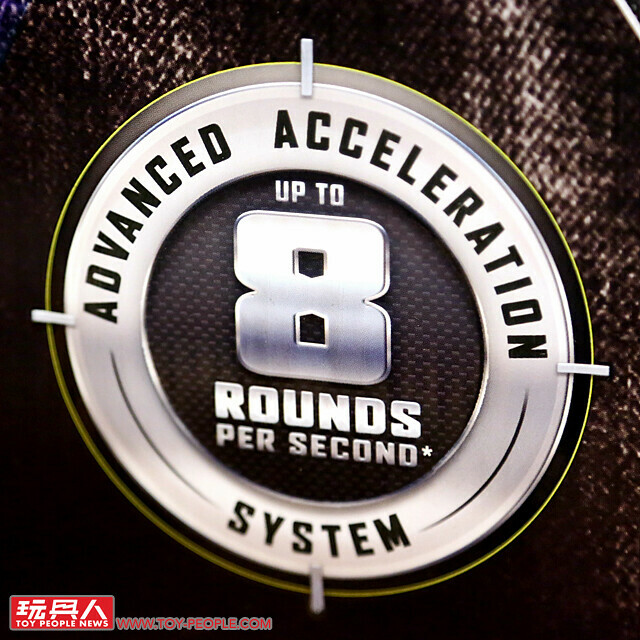 ▼ One big selling point of the Prometheus is its Advanced Acceleration System, capable of launching up to 8 rounds per second. 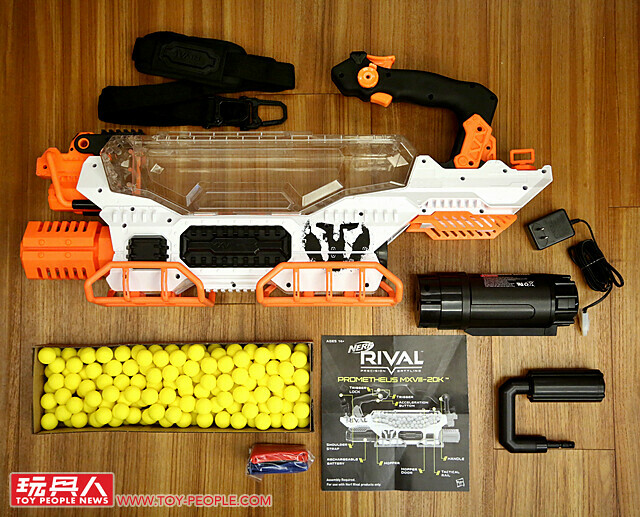 ▼ Contents: Prometheus MXVIII-20K, carry handle, shoulder strap, rechargeable NiMHbattery, battery charger, high-impact rounds x 200, team straps (red & blue) and instructions manual. 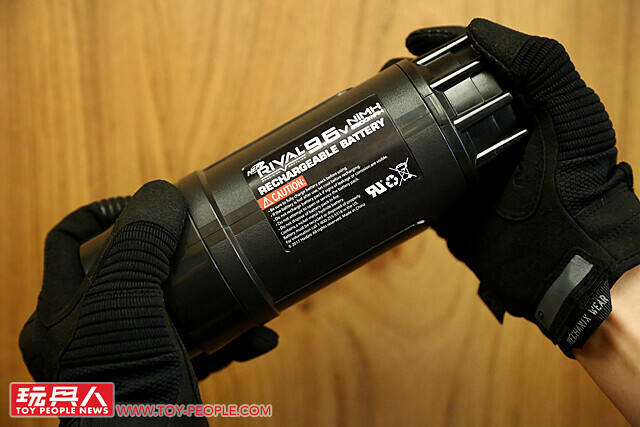 ▼ This sci-fi grenade looking thing is the rechargeable battery, way more convenient than having to shop for batteries! ▼ Clear instructions on how to clear a jam. Do TRY to read this thing! 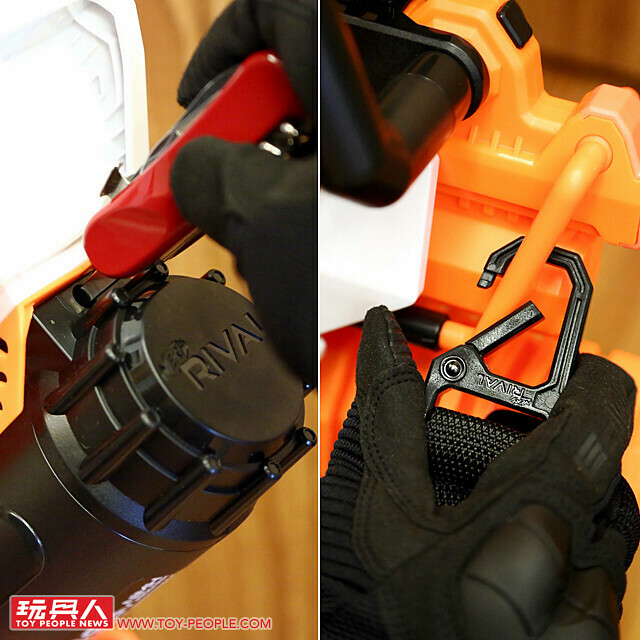 ▼ The carry handle can be installed in either left or right position depending on your dominant hand. Press down on the black button to remove the handle. 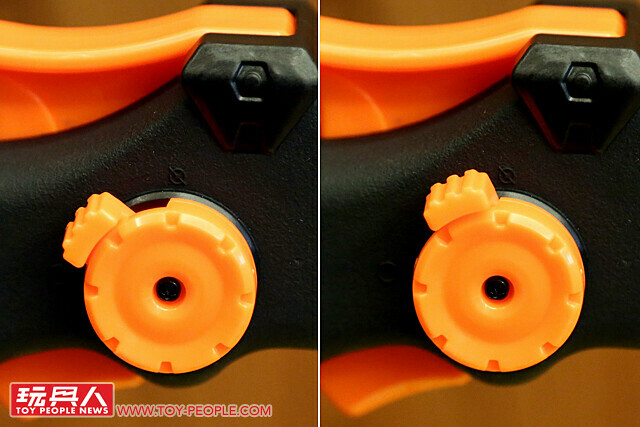 ▼ The two blaster guards on the bottom are made from a softer plastic and cannot be removed once attached. 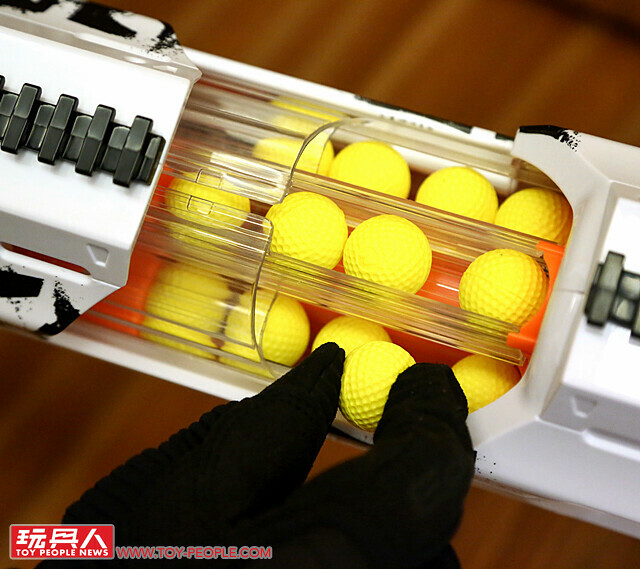 It is designed to absorb contact and protect your blaster should you drop it during play. 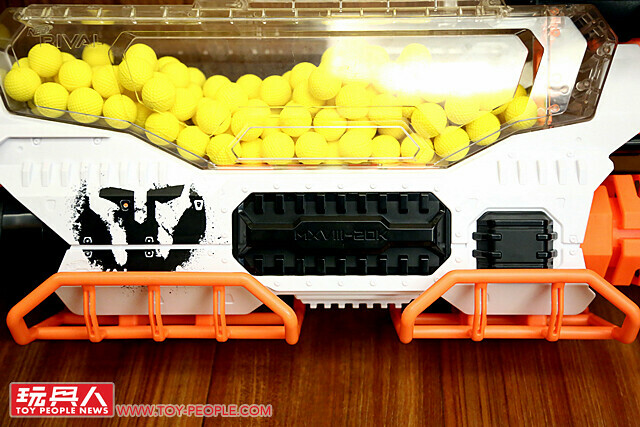 ▼ The rechargeable battery fits in the back of the blaster. 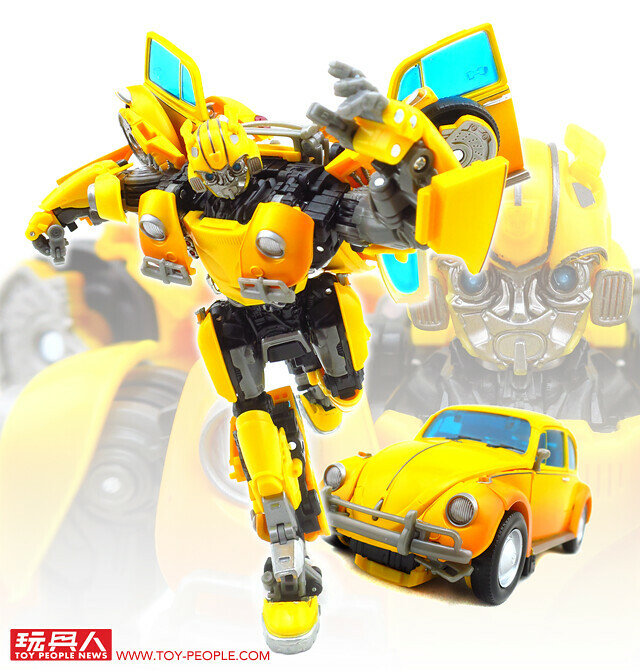 ▼ Be sure to screw in the battery once it is in place! Then, attach your shoulder strap. ▼ Open to clear hatch on top and let the ammo POUR IN! Prometheus, whose name means "forethought," is a Titan in Greek Mythology. Together with his brother Epimetheus, whose name means "afterthought", they represent the wisdom and folly of man. Prometheus created man from clay and Athena blessed them with life, thus creating mankind. 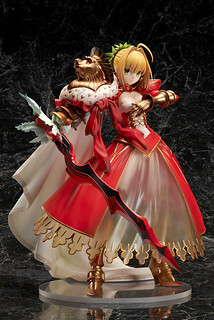 In the beginning, Zeus withheld fire from humanity, causing them to suffer in the cold and dark. 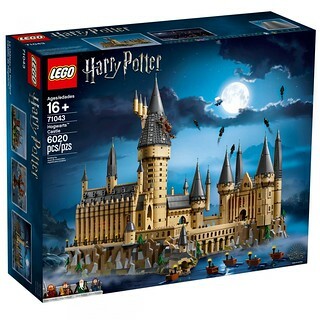 Seeing this, Prometheus stole fire from Mount Olympus, giving it to man and allowing them to prosper. This, however, angered Zeus, who retaliated by chaining Prometheus to a rock in Caucasus. 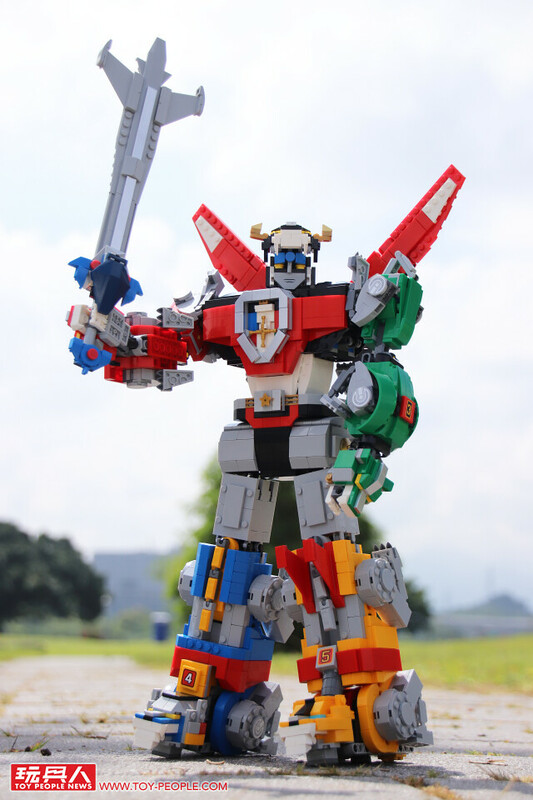 Each day, an eagle comes to eat his liver, which would grow back overnight, forcing the Titan to suffer for all eternity. 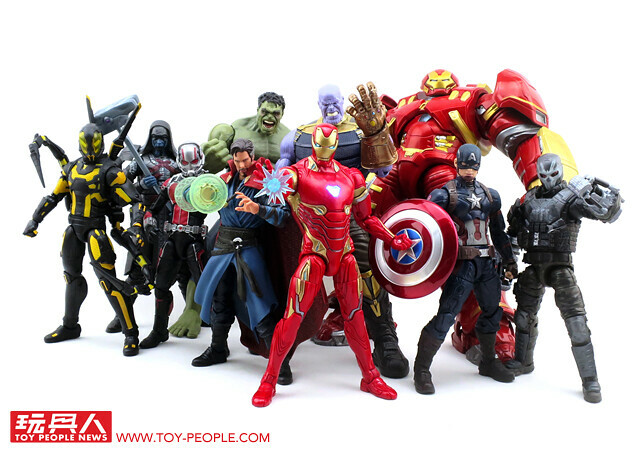 Millennia later, Hercules arrives in search of the Golden Apple. 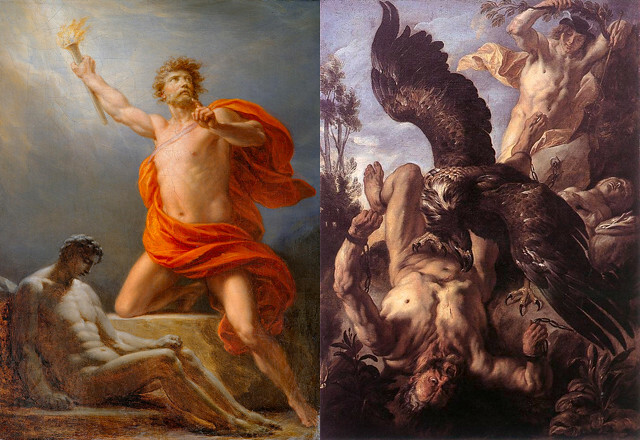 He kills the eagle, freeing Prometheus and replacing him with the centaur Chiron. 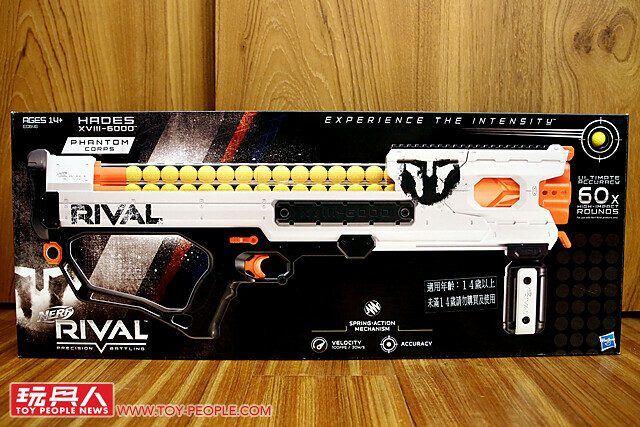 ▼ The complete Prometheus MXVIII-20K, with more magazing capacity and firing speed than any other Nerf Rival blaster! 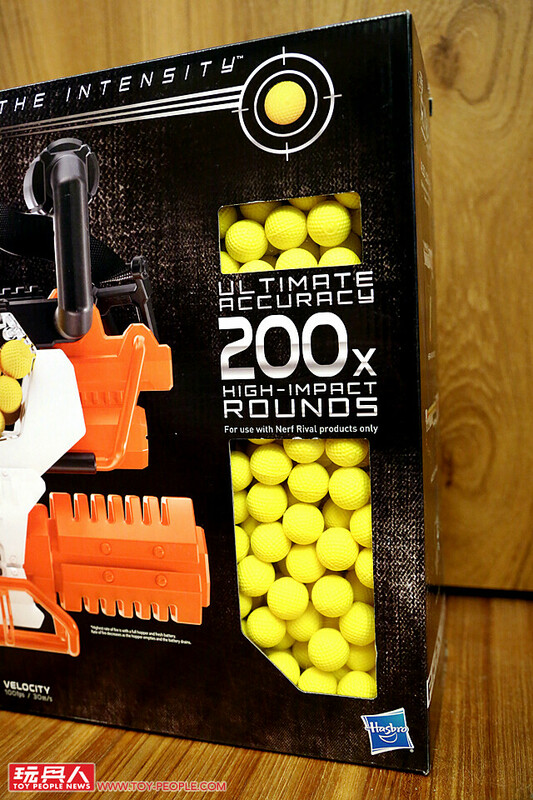 The hand-carry style allows for an smoother and more stable blasting experience. 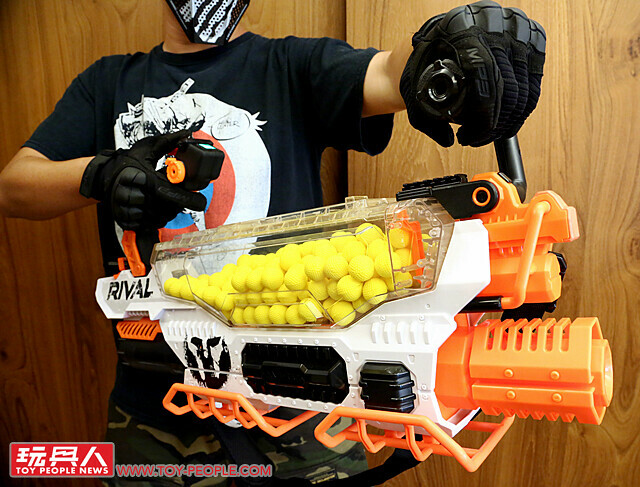 Does this surpass the Nemesis MXVII-10K to become the definitive Nerf Rival blaster? Let's find out! 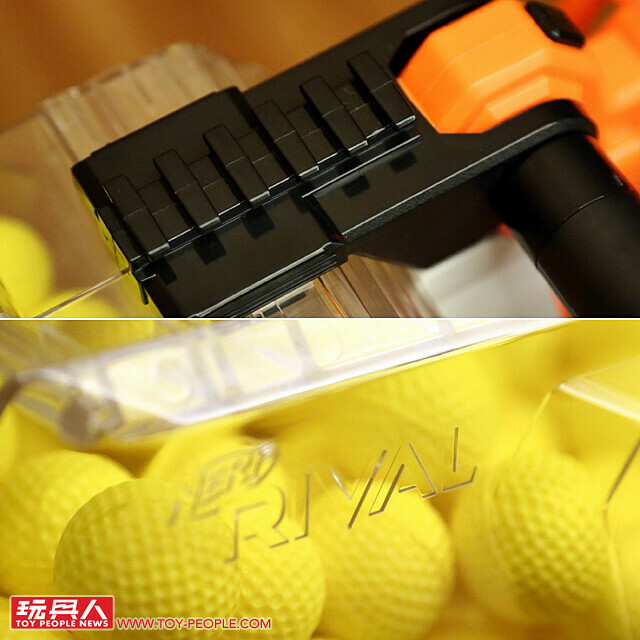 ▼ The Nerf Rival logo printed next to the blaster grip. ▼ The Rival insignia printed next to the MXVIII-20K carving. 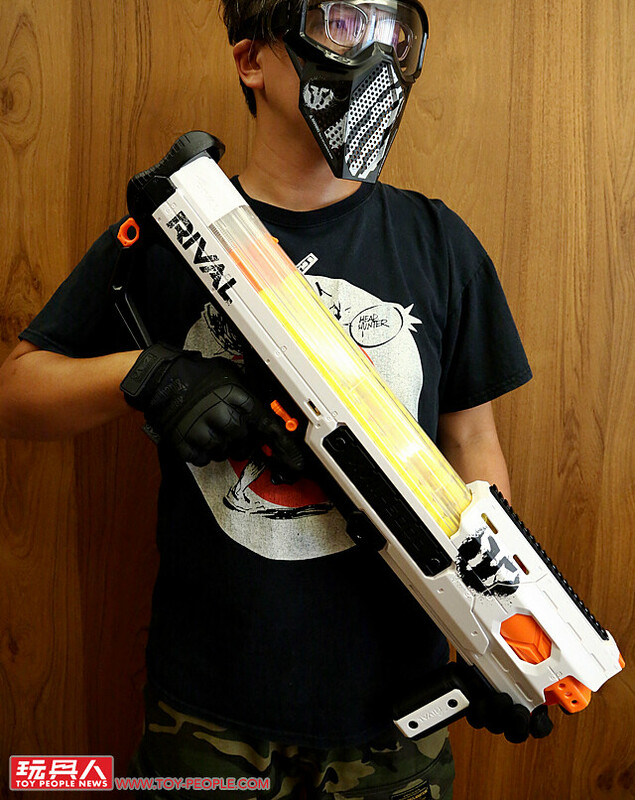 ▼ Small tactical rail on top for Nerf Rival scopes and other accessories. 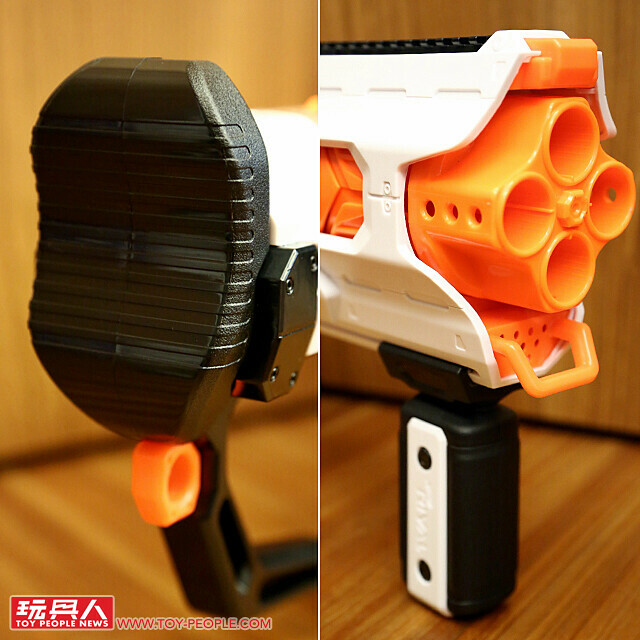 ▼ The muzzle looks aggressive with a cooling port design. 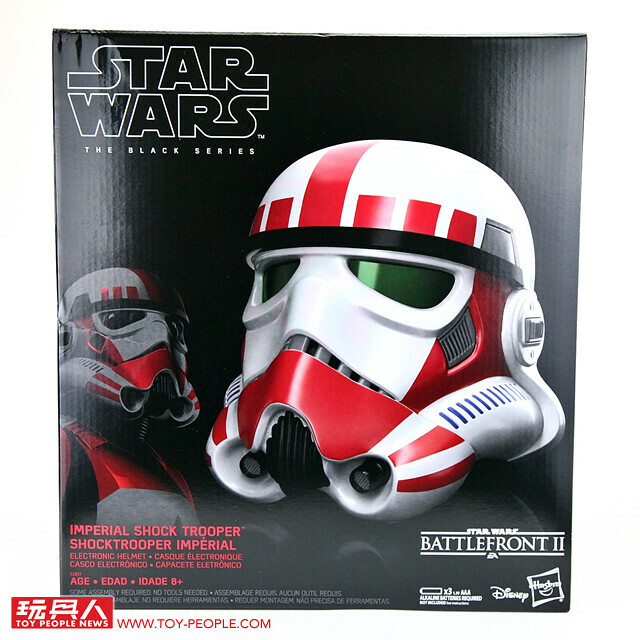 ▼ Two blaster safety guards attached to the bottom to protect your $200 investment! 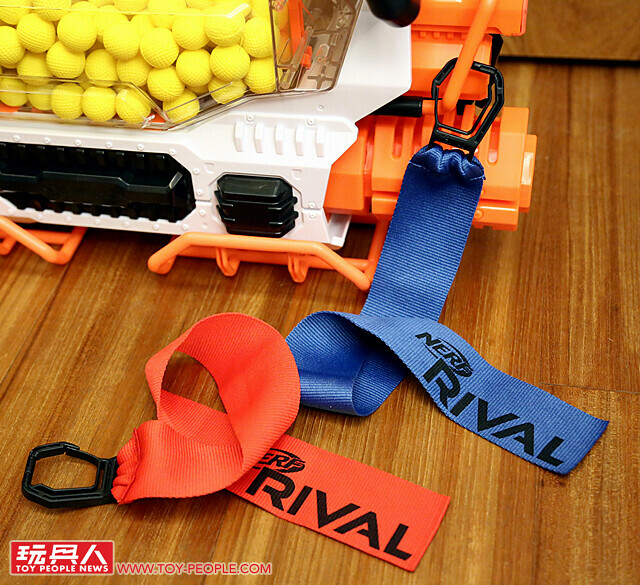 ▼ You can attach your team flag to the sling mounts as well. 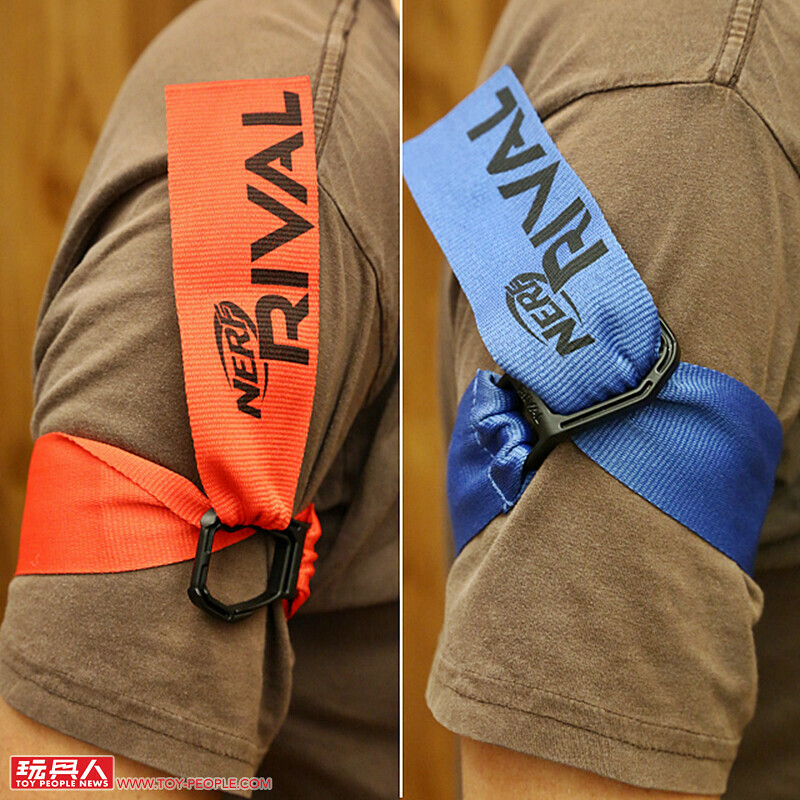 ▼ The nylon shoulder sling includes a strap for comfort, perfect for drawn-out battles and firing sessions. 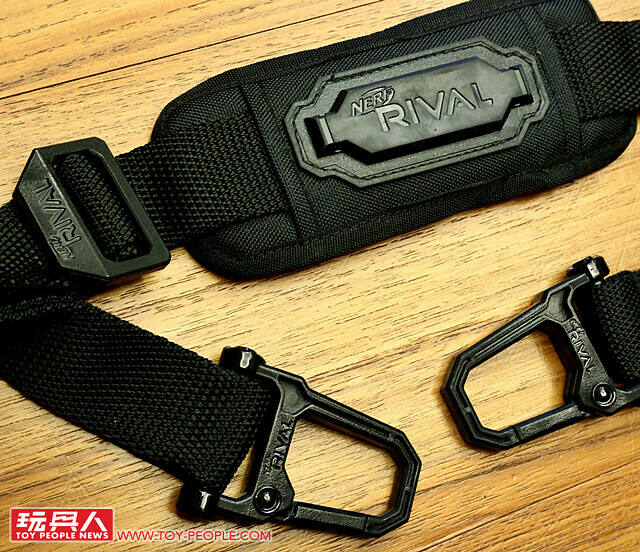 ▼ Of course, the shoulder strap can be adjusted in length for firing and carry as well. 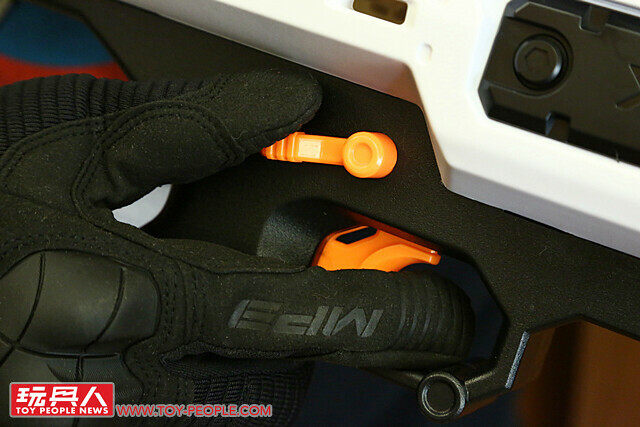 ▼ The blaster safety is easily accessible for both left-handed and right-handed players. 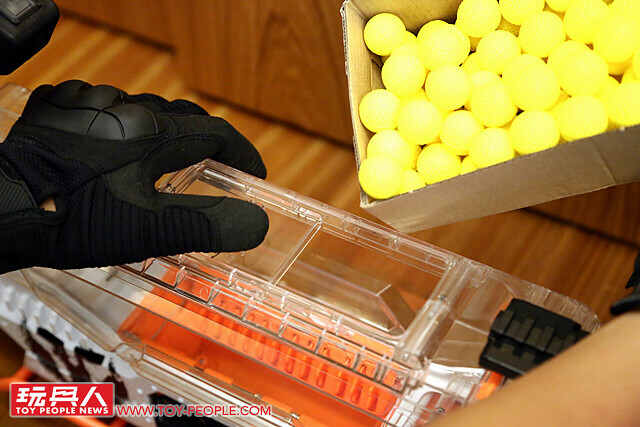 ▼ Turn off the safety and press the trigger to engage the firing mechanism. 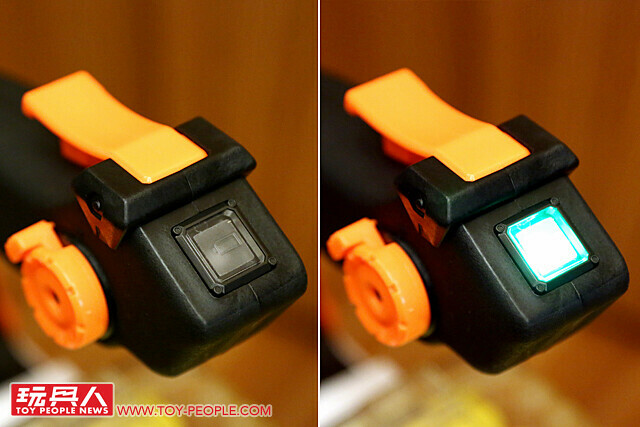 The light will flash green when the flywheel is activated and the battery is charged. 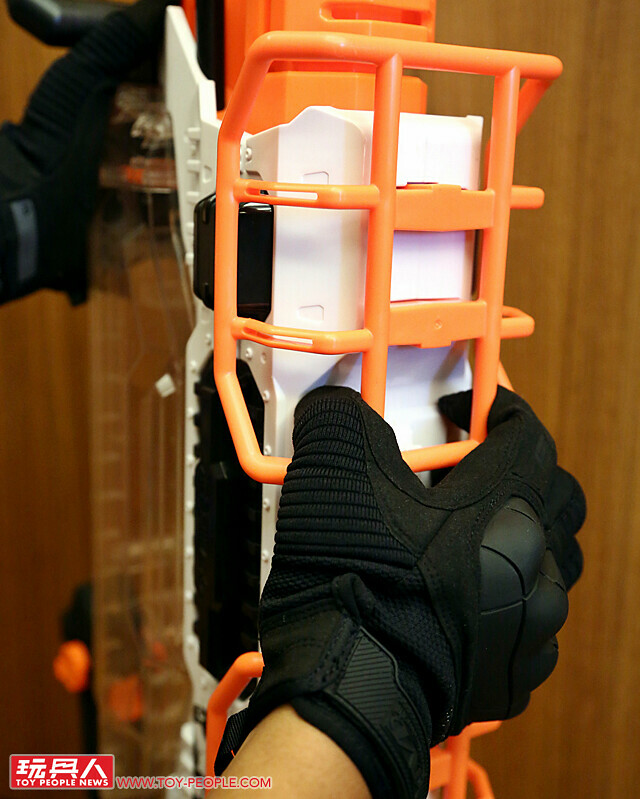 ▼ The blaster includes a dual-trigger firing mechanism to prevent accidental blasting. 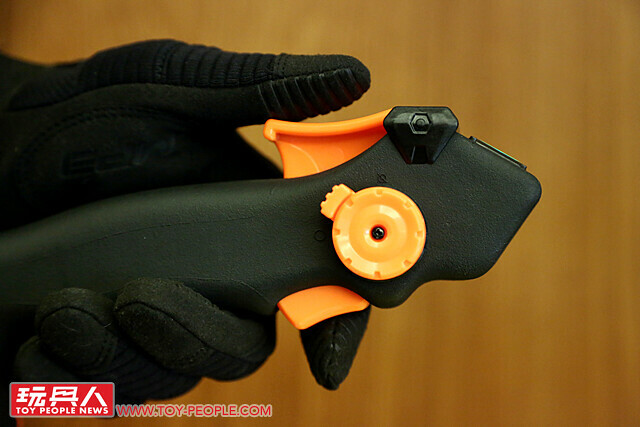 Press the top trigger with your thumb to engage the flywheel and click the bottom trigger with your index finger to fire. Hold or click the trigger to control your firing count. 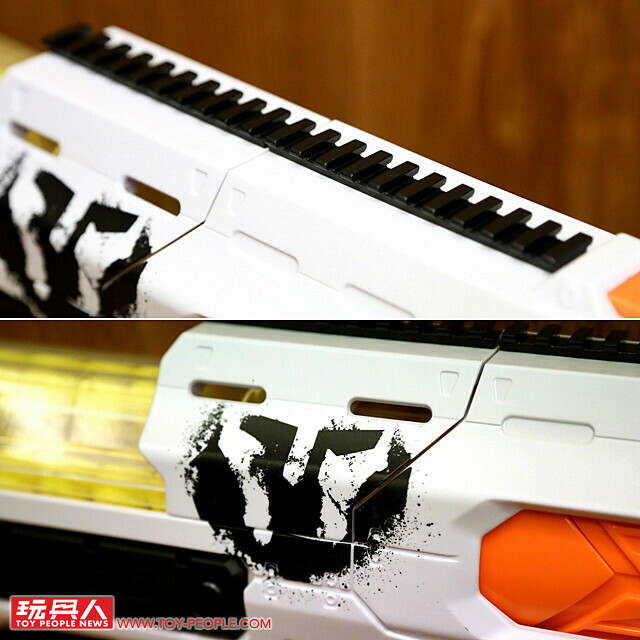 ▼ If you thought the Nemesis was heavy, wait till you get a load of this bad boy with double the magazine capacity. 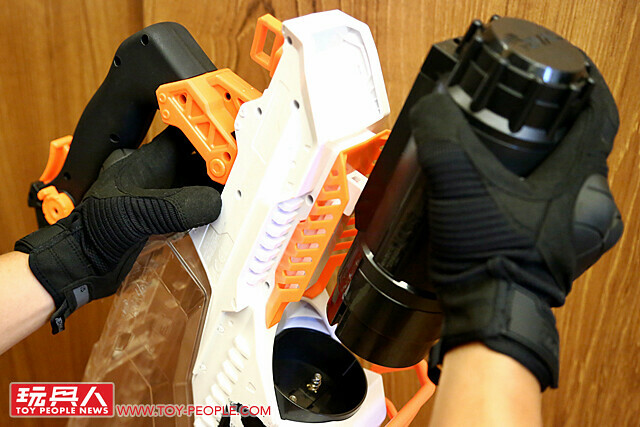 But with the assistance of the shoulder sling and two handle carry, this blaster is easy to maneuver and fire and is a whole lot of fun! 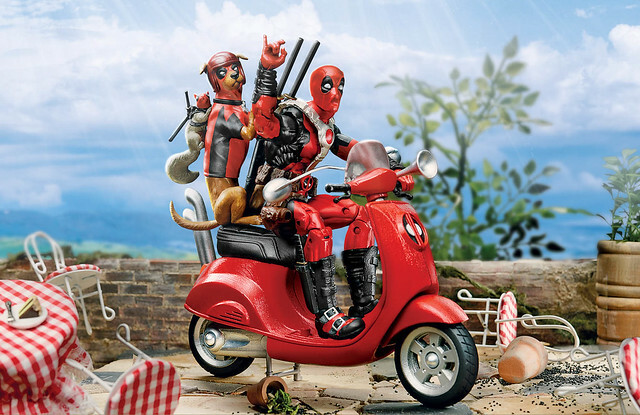 ▼ Say Hello to my little friend!!! 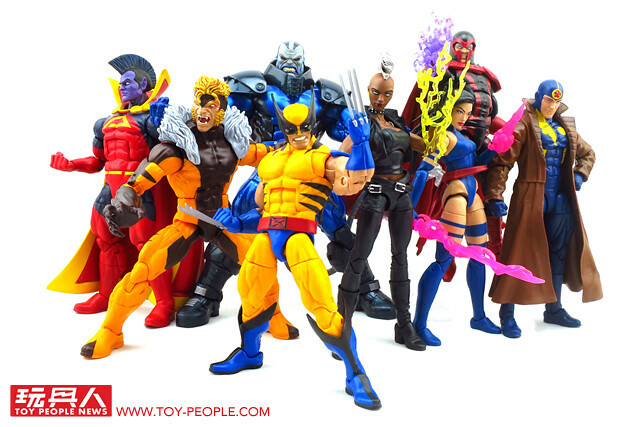 Hasbro Marvel Legends Series 6-inch-scale figures and vehicles Deadpool、Professor X Info Revealed!